This first year of programming will launch the space beyond the hard edged constructed/ concrete/gravel site into a softer-edged, welcoming place that people feel worth crossing Prior to pop by and check out what is happening while on evening strolls. Park Board planning dept. has created the base for us to build on for this success, now with assistance from Vancouver Park Board Matching Funds and an Artstarts grant we can dedicate the time for artist/community engagement that builds on what currently exists. Each part of this project is designed to enhance the site and is coordinated around a specific cross-section of the community. There remains space for individuals to join in, and events and celebrations are planned that bring our different working groups together. We have a residency with Strathcona Elementary school grade 6/7 class for working both in the classroom and in the park. And with children taking ownership and pride in the place with what they create, we predict parents will be walked over to the park to observe, celebrate and collaborate on various project steps. Pollinator House: The large grassy meadow areas planted at Trillium consist of Perennial Ryegrass, Quatro Sheeps fescue, strawberry clover, English daisy, white yarrow, baby blue eyes and carpet of snow plantings. It has been identified that without a strong pollinator presence on site, these meadows with time will be taken over by common grasses and we will lose the rich plant diversity we currently have. Food security and sovereignty are both big concerns in the Strathcona community and building the local native pollinator house becomes a way to both educate community in how to support the pollination of their own gardens and acts as a catalyst to bring together the school students and food security-aware parents on a common goal. 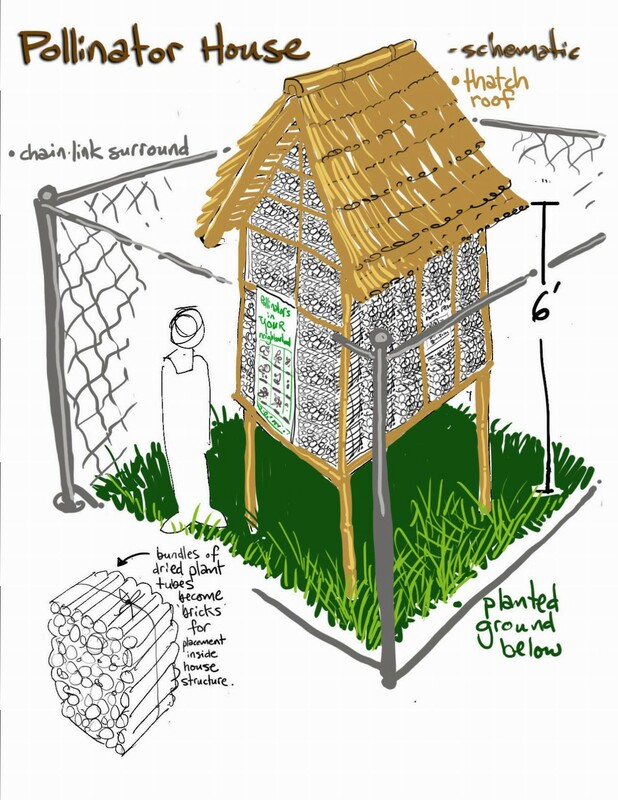 The location of the pollinator hut is a secured 4 x 4ft area with a 6 ft high fence. It is perfect as protection for a woven structure housing pollinators that will assist in keeping our grassy meadows a species-diverse area. 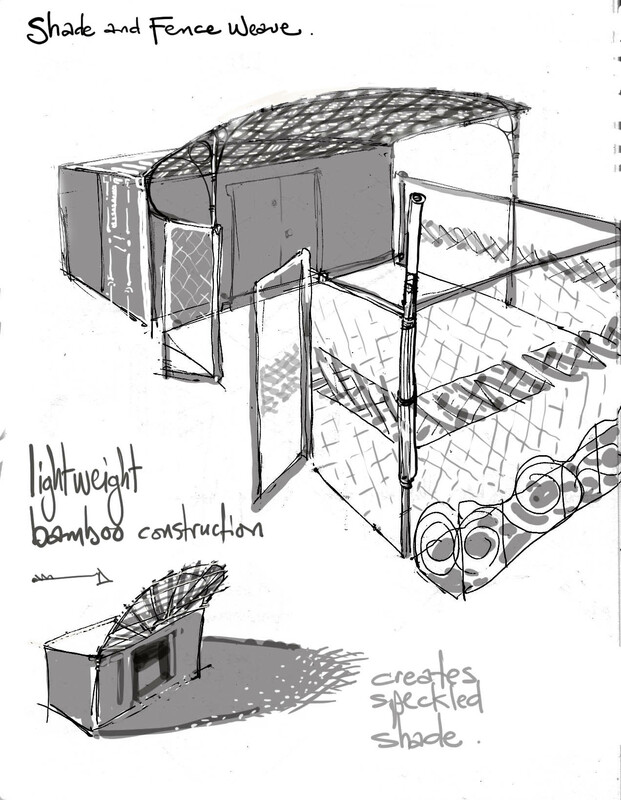 Strathcona Food Security Committee, grade 6/7 students will join Erin Udal of Environmental Youth Alliance and our local artists to build the house this March- April. ShadeWeave: This is the first time shipping containers have been modified and designed for a site with fenced outside work bays. The area alas has no shade and becomes terribly hot to work in by early summer. Weaving a shade canopy will extend our comfortable work times into the heat of the day without creating a rain shelter that gets used as a sleeping location such as what happens under the main covered work area. We look forward to working with Raycam Youth on this part of the project in May and June! 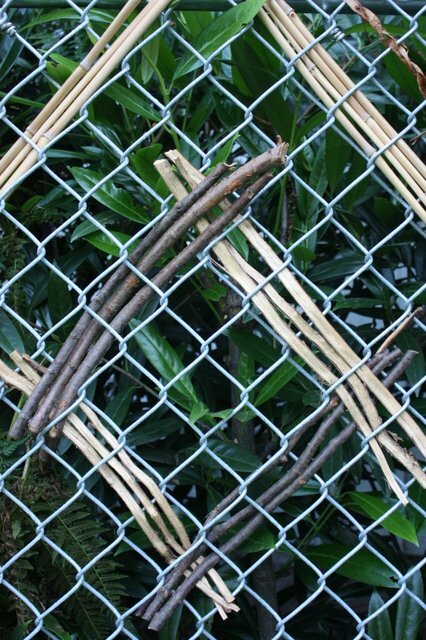 EarthLoom: Serves as a community marker of the seasons, with new weaving materials being available throughout each season. Long term, the EarthLoom will be warped up periodically for ongoing participation, this first warp and weave takes place as a part of the Terroir:Urban Cloth Project and uses fibre plants harvested along Malkin street throughout 2013. The EarthLoom becomes a park feature and conversation point- a spot to showcase how the plants in the park can been processed and woven in a variety of ways. 2 Responses to Trillium Spring 2015 projects! I would love to see a map of the park, and directions to getting there, on your website. Great suggestion Janet- and done! Find on our Home Page now a map and directional assistance. thanks!